and how does it all fit together and what does it all MEAN? finally I think I understand how all these pieces fit together, more or less. There are still probably some mistakes in this post, please let me know what they are! (I’m b0rk on twitter). I’m going to leave strace out of this post (even though it’s my favorite thing) because the overhead is so high – in this post we’re only going to talk about tracing systems that are relatively fast / low overhead. This post also isn’t about sampling profilers at all (which is a whole other topic!). Just tracing. The thing I learned last week that helped me really understand was – you can split linux tracing systems into data sources (where the tracing data comes from), mechanisms for collecting data for those sources (like “ftrace”) and tracing frontends (the tool you actually interact with to collect/analyse data). The overall picture is still kind of fragmented and confusing, but it’s at least a more approachable fragmented/confusing system. here’s what we’ll talk about: (with links if you want to jump to a specific section). All of these things are possible, but it turns out the tracing landscape is actually pretty complicated. Okay, let’s do data sources! This is kind of the most fun part – there are so many EXCITING PLACES you can get data about your programs. A probe is when the kernel dynamically modifies your assembly program at runtime (like, it changes the instructions) in order to enable tracing. This is super powerful (and kind of scary!) because you can enable a probe on literally any instruction in the program you’re tracing. (though dtrace probes aren’t “probes” in this sense). Kprobes and uprobes are examples of this pattern. A tracepoint is something you compile into your program. When someone using your program wants to see when that tracepoint is hit and extract data, they can “enable” or “activate” the tracepoint to start using it. Generally a tracepoint in this sense doesn’t cause any extra overhead when it’s not activated, and is relatively low overhead when it is activated. USDT (“dtrace probes”), lttng-ust, and kernel tracepoints are all examples of this pattern. KProbes are a debugging mechanism for the Linux kernel which can also be used for monitoring events inside a production system. You can use it to weed out performance bottlenecks, log specific events, trace problems etc. To reiterate – basically kprobes let you dynamically change the Linux kernel’s assembly code at runtime (like, insert extra assembly instructions) to trace when a given instruction is called. 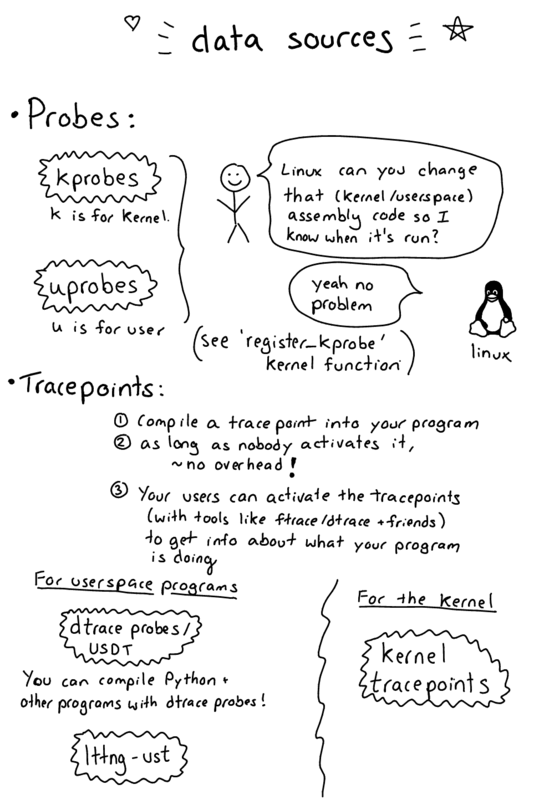 I usually think of kprobes as tracing Linux kernel function calls, but you can actually trace any instruction inside the kernel and inspect the registers. Weird, right? Brendan Gregg has a kprobe script that you can use to play around with kprobes. from the examples and right away it started printing out every file that was being opened on my computer. Neat!!! You’ll notice that the kprobes interface by itself is a little gnarly though – like, you have to know that the filename argument to do_sys_open is in the %si register and dereference that pointer and tell the kprobes system that it’s a string. Uprobes are kind of like kprobes, except that instead of instrumenting a kernel function you’re instrumenting userspace functions (like malloc). brendan gregg has a good post from 2015. Tracing uprobe readline (r:readline /bin/bash:0x9a520 +0($retval):string). Ctrl-C to end. bash-10482  d...  1061.417373: readline: (0x42176e <- 0x49a520) arg1="hi"
bash-10717  d...  1063.737625: readline: (0x42176e <- 0x49a520) arg1="hi"
bash-10717  d...  1067.091402: readline: (0x42176e <- 0x49a520) arg1="yay"
bash-10717  d...  1067.738581: readline: (0x42176e <- 0x49a520) arg1="wow"
bash-10717  d...  1165.196673: readline: (0x42176e <- 0x49a520) arg1="cool-command"
USDT stands for “Userland Statically Defined Tracing”, and “USDT probe” means the same thing as “dtrace probe” (which was surprising to me!). You might have heard of dtrace on BSD/Solaris, but you can actually also use dtrace probes on Linux, though the system is different. It’s basically a way to expose custom events. For example! Python 3 has dtrace probes, if you compile it right. How to tell if you have dtrace probes, from the Python docs. Basically you poke around in the binaries with readelf and look for the string “stap” in the notes. If you want to read more about dtrace you can read this paper from 2004 but I’m not actually sure what the best reference is. 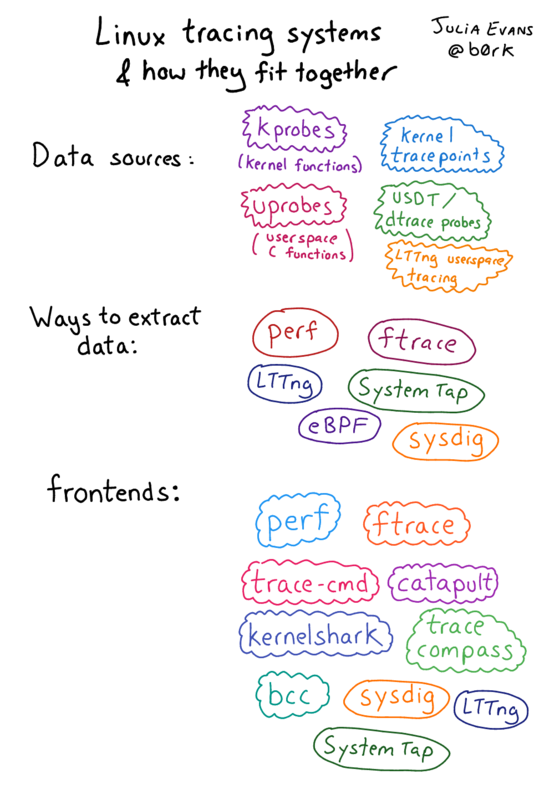 I don’t understand LTTng super well yet but – my understanding is that all of the 4 above things (dtrace probes, kprobes, uprobes, and tracepoints) all need to go through the kernel at some point. lttng-ust is a tracing system that lets you compile tracing probes into your programs, and all of the tracing happens in userspace. This means it’s faster because you don’t have to do context switching. I’ve still used LTTng 0 times so that’s mostly all I’m going to say about that. To understand the frontend tools you use to collect & analyze tracing data, it’s important to understand the fundamental mechanisms by which tracing data gets out of the kernel and into your grubby hands. Here they are. (there are just 5! 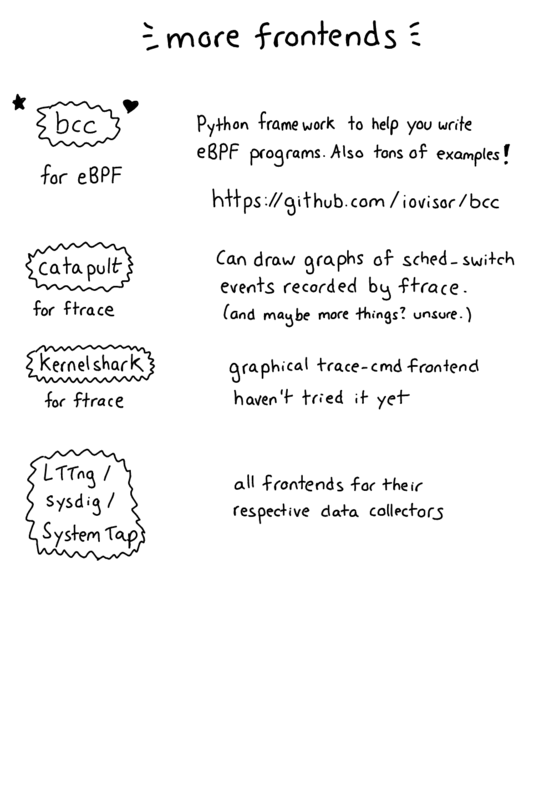 ftrace, perf_events, eBPF, systemtap, and lttng). 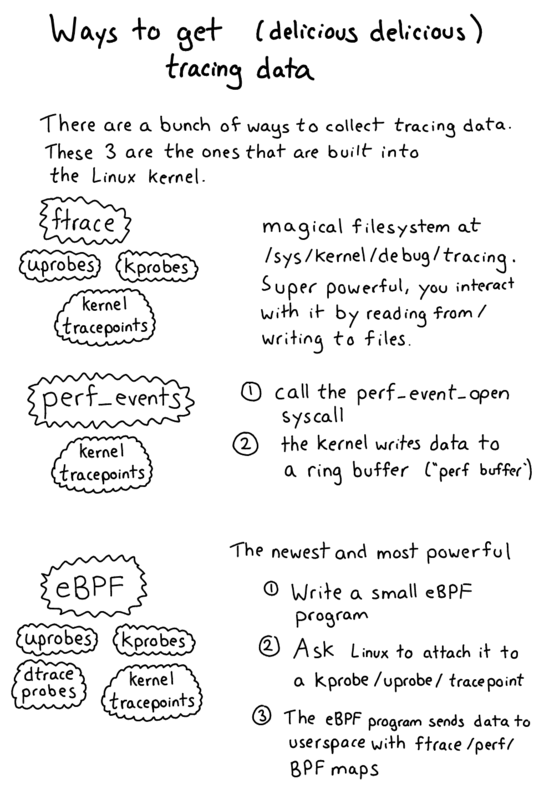 Let’s start with the 3 that are actually part of the core Linux kernel: ftrace, perf_events, and eBPF. Those ./kprobe and ./uprobe scripts up there? Those both use ftrace to get data out of the kernel. 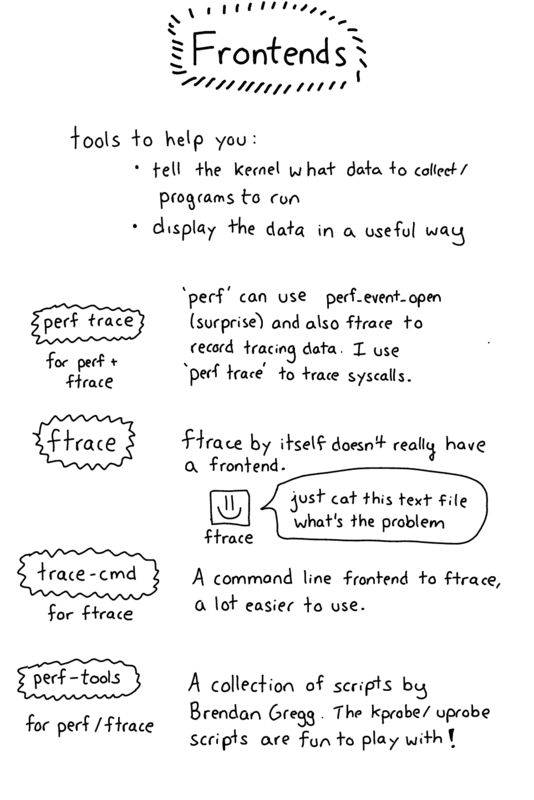 Ftrace is a kind of janky interface which is a pain to use directly. Basically there’s a filesystem at /sys/kernel/debug/tracing/ that lets you get various tracing data out of the kernel. * I think that’s it. eBPF is a VERY EXCITING WAY to get data. Here’s how it works. You write an “eBPF program” (often in C, or likely you use a tool that generates that program for you). You have your precious precious data! Sysdig is a kernel module + tracing system. It lets you trace system calls and maybe some other things? I find their site kind of confusing to navigate, but I think this file contains the list of all the events sysdig supports. So it will tell you what files are being opened but not the weird internal details of what your TCP stack is doing. LTTng (linux tracing: the next generation) is from Montreal (a lab at ecole polytechnique)!! which makes me super happy (montreal!!). I saw an AMAZING demo of tool called trace compass the other day that reads data that comes from LTTng. Basically it was able to show all the sched_switch transitions between programs and system calls when running tar -xzf somefile.tar.gz, and you could really see exactly what was happening in a super clear way. 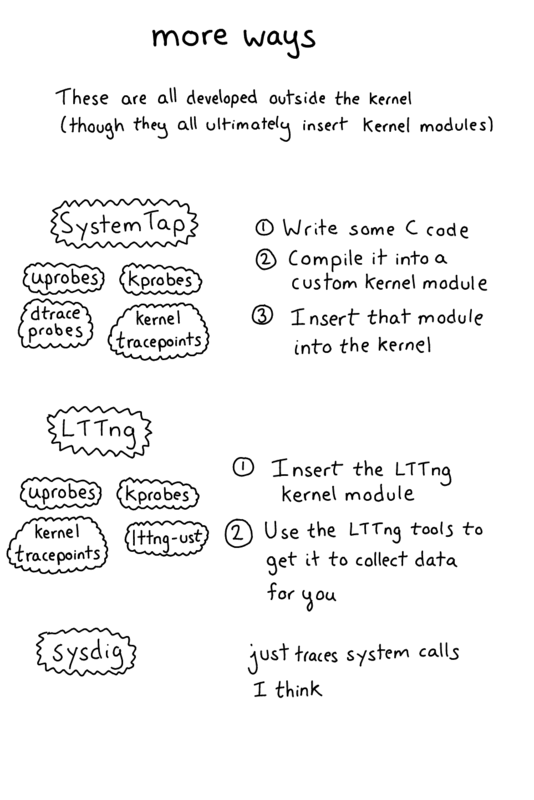 The downside of LTTng (like SystemTap) is that you have to install a kernel module for the kernel parts to work. With lttng-ust everything happens in userspace and there’s no kernel module needed. The only frontend here is perf, it’s simple. Catapult lets you analyze ftrace output. It’s for Android / chrome performance originally but you can also just analyze ftrace. So far the only thing I’ve gotten it to do is graph sched_switch events so you know which processes were running at what time exactly, and which CPU they were on. Which is pretty cool but I don’t really have a use for yet? The only I know of is the bcc framework: https://github.com/iovisor/bcc. It lets you write eBPF programs, it’ll insert them into the kernel for you, and it’ll help you get the data out of the kernel so you can process it with a Python script. It’s pretty easy to get started with. If you’re curious about the relationship between eBPF and the BPF you use in tcpdump I wrote a post about eBPF & its relationship with BPF for packet filtering the other day. I think it might be easiest though to think of them as unrelated because eBPF is so much more powerful. bcc is a bit weird because you write a C program inside a Python program but there are a lot of examples. Kamal and I wrote a program with bcc the other day for the first time and it was pretty easy. LTTng & SystemTap both have their own sets of tools that I don’t really understand. THAT SAID – there’s this cool graphical tool called Trace Compass that seems really powerful. It consumes a trace format called CTF (“common trace format”) that LTTng emits. perf trace is good, it will trace system calls with low overhead and it’s super simple, there’s not much to learn. A+. For everything else, they’re, well, an investment, they take time to get used to. I think playing with kprobes is a good idea (via eBPF/ftrace/systemtap/lttng/whatever, for me right now ftrace is easiest). Being able to know what’s going on in the kernel is a good superpower. ftrace is kind of a huge pain, I think it would be worth it for me if I could find a good frontend tool but I haven’t managed it yet. I’m really excited that now I (mostly) understand how all these pieces fit together, I am literally typing some of this post at a free show at the jazz festival and listening to blues and having a fun time. Now that I know how everything fits together, I think I’ll have a much easier time navigating the landscape of tracing frontends! Brendan Gregg’s awesome blog discusses a ton of these topics in a lot of detail – if you’re interested in hearing about improvements in the Linux tracing ecosystem as they happen (it’s always changing! ), that’s the best place to subscribe. thanks to Annie Cherkaev, Harold Treen, Iain McCoy, and David Turner for reading a draft of this.